Do you need to present your business in a professional manner? Do you have a limited budget? If so, you can benefit from our office rentals that start at only $600 per month and rent will include access to furnished reception areas and conference rooms. The on staff executive assistants will answer incoming calls and greet your guests in a professional manner. All of these features are included in the low rental cost. Access to your rented space 24 hours a day, seven days a week and 365 days a year. The option of unfurnished or furnished offices. 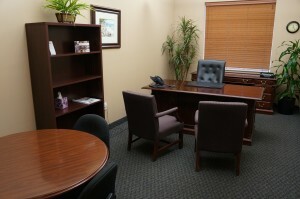 Access to the furnished reception areas and conference rooms. Receptionists to meet your guests. Telesecretaries for answering any incoming phone calls to your business. Complimentary coffee for you and your clients. We never charge our clients for access to our parking area, utilities, taxes, janitorial service or pest control. You can even rent a furnished office one day a week in order to emerge into a new market. We make growing and expanding your business flexible! We make running, growing and managing your business simple with the professional services you find here.